The small pool is a remainder of a cutoff of the Ohře river, and its water soaks into the small pool. The water area is currently overgrown with common cattail. The bank vegetation consists of old poplar, willows, aspen, elm and oak trees. Bushes like black elder, spindle tree, chokecherry, and black dogwood border the small pool. On the shore of the small pool also grow reed-grass, bitter-sweet, bur-marigold, bur reed, hops, common reed, nettle, water chickweed, purple loosestrife and sweetflag. There are also many fish and amphibians. The small pool is used for fishing by the Czech Assosiation of Fishermen of Louny. 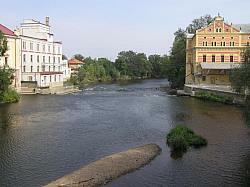 Louny’s small pool was registered in 1993 by Louny’s Department of Environment as an important landscape element. 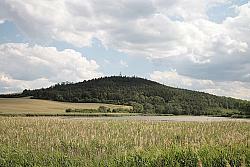 The Louny Middle Mountains area, part of the Czech Middle Mountains, is a landscape consisting of extinct touchstone volcanoes. The most dominant features are the hills Raná (457m above sea level) and Oblík (509m above sea level), both declared national nature preserves. The original flood-plain forests have been cut down. Today’s path is lined with full-grown hawthorns with bushes, an appropriate shelter for many birds and other small animals. The last stop is located near the former restaurant Lužerady whitch became popular for its Sunday family trips.The restaurant was situated in the Schwarzenberg gamekeeper’s lodge - the establishment of the regent of the surrounding forests. The presence of the flood-plain forests is illustrated in the local name of the village Lužerady (lužní = flood-plain). Extensive grassland vegetations were also gradually transformed into the fields. Fragments of oak vegetation behind the former pub are significant. A one hundred year old lime tree grew in the yard of the former pub, but was rooted up during the time of the occupation.Preserved conker and ash alleys border the abandoned area.